Be the first to share your favorite memory, photo or story of Ivy. This memorial page is dedicated for family, friends and future generations to celebrate the life of their loved one. 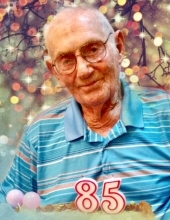 Ivy Eugene Vowell passed away at the Northern Arizona Veteran’s Hospital on February 4, 2019, at the age of 85 years. He was born in Tupelo, Mississippi to Ivy and Sadie Vowell. Ivy is survived by his children, Tony (Cindy) Vowell, Gary (Teresa) Vowell, Gloria Vowell, 10 grandchildren, 24 great-grandchildren, and a sister Marie (Bill) Murphy. He is preceded in death by his beloved wife Mildred, children Jimmy, Bobby and Kelly Vowell, brothers Albert and James and sister Aline. Ivy was very proud to serve his county in the United States Air Force for 20 years, affording freedom to every citizen of our county. He found joy in remodeling and repairing homes and enjoyed growing rose bushes. Ivy was a proud and dedicated father and husband. He loved his family and country with all his heart. In lieu of flowers please make donations in Ivy’s name to the Northern Arizona Veteran’s Hospital, 500 N. Hwy 89, Prescott, AZ 86313. To send flowers or a remembrance gift to the family of Ivy Eugene Vowell, please visit our Tribute Store. "Email Address" would like to share the life celebration of Ivy Eugene Vowell. Click on the "link" to go to share a favorite memory or leave a condolence message for the family.